YOKOHAMA - Mike Zagurski was rehabbing an injury several years ago, while with the Philadelphia Phillies’ organization, when he decided he wanted a dog. He soon told his girlfriend (now wife) of his intention and also informed housemates Scott Mathieson and Kyle Drabek. Naturally, Zagurski came home one day with a pair of cats. Making adjustments on the fly is nothing new to Zagurski, whose career has taken him on a wild ride that’s included stops in Anchorage, Alaska, Hiroshima and a slew of locales in between. 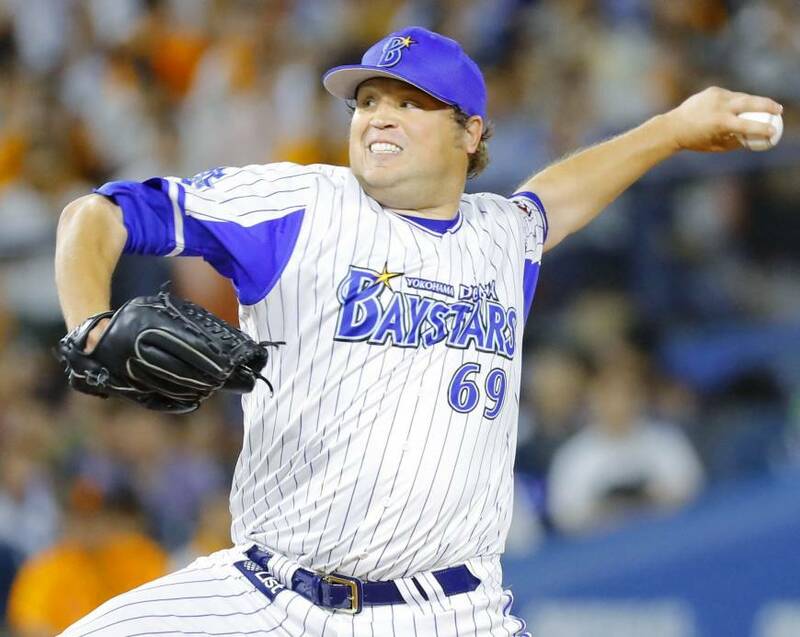 He joined the BayStars on April 3, and made his debut with the team April 24. The left-handed reliever is currently 3-0 with two holds in 22 appearances. “I’m in my 12th year now, and it’s gone pretty fast,” Zagurski, 33, said. “I’ve had a lot of ups and downs. Even the downs I’ve had I wouldn’t trade in because they’ve made me a better player and a better person. Zagurski, who made 19 appearances for the Hiroshima Carp last season, his first in Japan, was in Arizona working out for U.S. teams when the BayStars came with an offer to return to Japan, which had been Zagurski’s priority. “I had to see it all the way through,” he said. Being in Japan has allowed Zagurski to reunite with his old roommate Mathieson, who is currently in his fifth year with the Yomiuri Giants. “It’s definitely cool seeing him here,” Mathieson said. The former Phillies pitchers became close while rehabbing together earlier in their careers. They roomed together on the road while in Double-A with the Reading Fightin Phils and lived together in Triple-A while playing for the Lehigh Valley IronPigs (both in Pennsylvania). In Japan, the bond remains as strong as ever. Since Mathieson was already playing in Japan, Zagurski was able to get a lay of the land before his own move last season. “Even before he came over, he was asking about it,” Mathieson said. “He’s a huge stat guy. You can ask him anybody’s numbers, any team back home, he’s knows what’s going on, any sport. Having already experienced Japan has given Zagurski a leg up in Yokohama. He’s also been quickly embraced by BayStars fans and feels the overall situation in Yokohama is a positive one. “The fan support has been great. I think it starts at the top. Alex puts us in a good position to play and lets us go play and he keeps us in every ball game,” he said, referring to manager Alex Ramirez. “We could be down 6-0 in the fourth inning and in the bullpen, and it’s still like, we gotta a chance in this thing. It’s just kind of the attitude of the team. I think you see it with the way we play. It’s not over until we make that last out. The BayStars, who have never reached the Climax Series, are currently third in the CL standings, 11½ games behind the Carp. But just as they feel contests aren’t over until the last out, Zagurski says the team isn’t ready to concede the pennant yet either.